I have been truly fascinated by the use of cloth as a collage element. Within the last few years, I have been experimenting with fabric, beading, painting, printmaking, and found objects that can be attached to cloth. My fiber collages have developed from personal experience and interests. 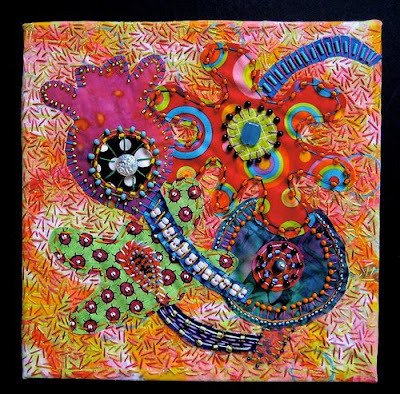 I love the way textile art can push the boundaries of traditional quilting and sewing. I like to add color and textures to the fabrics with anything I can find. So, I am always searching for buttons, trim, unusual beads, old jewelry, rubber stamps, paint, and any other items to make my fiber collages unique. I really don’t think people realize the selections of fabrics, threads and embellishments that available today and how much time and energy goes into making one of my fiber pieces. I want to make my artwork memorable, so I spend a lot of time scrutinizing every piece of cloth and design element. When people are passing by my work, I want them to stop and stare. To me, that is the biggest compliment anyone can pay me. I like the way traditional sewing and quilting are evolving into a contemporary art form. Being a painter and fine artist, I find textiles have been a great way of expressing myself. Beautiful designs. 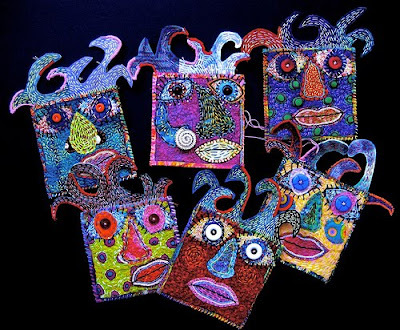 Susan's works are so vibrant, they practically sing! I'm so glad to "meet" her. I'm head to her sites to see more. 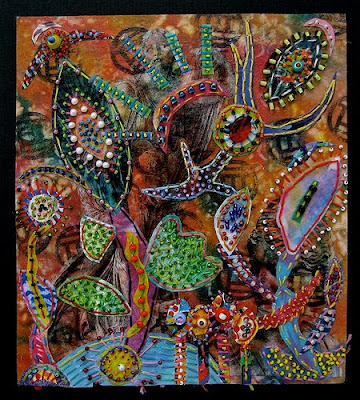 What a cool mixed media collage! Susan has an eye for color and texture blending both beautifully in that collage! It's something I would never have thought of.